Walking twelve miles through the centre of London. When you say it quickly, it doesn’t sound too difficult, does it? Add crossing 12 different London bridges along the way, ramp it up a little more by insisting you visit a dozen of the capital city’s most famous landmarks, capturing photos for evidence… and then you’ve got a challenge on your hands! …And this was the exact task the Butlin’s Sales and Marketing team were challenged with to raise money for Great Ormond Street Hospital Children’s Charity. 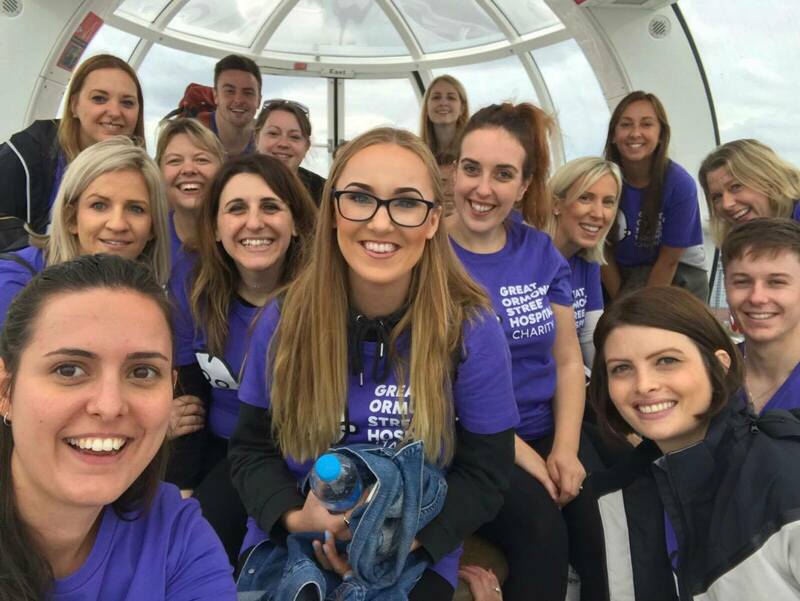 Having climbed Snowdon and played Human Monopoly for previous challenges, for their 2017 fundraiser the team strode it out from Chelsea on the west of London all the way along the Thames and as far as Tower Bridge. We like to go above and beyond when it comes to GOSH. Since we started our partnership with them in 2015, we’ve raised almost £400,000. With this, we have funded a Play Worker each year (a Play Worker organises play and activities to take the patients’ minds off their illness or treatment and gives their parents a break for a precious hour or two, they also use fun techniques to help younger children understand and/or prepare for their treatment). We’ve also raised enough to purchase a MiSeq Analyser… a piece of equipment that allows the hospital to quickly diagnose rare diseases, including the ability to test babies in the womb. This year, we’re funding the repair and restoration of the hospital’s Pharmacy Robot… sadly many of the robot’s critical functions have failed and it needs some urgent treatment of its own to make it fully operational again. 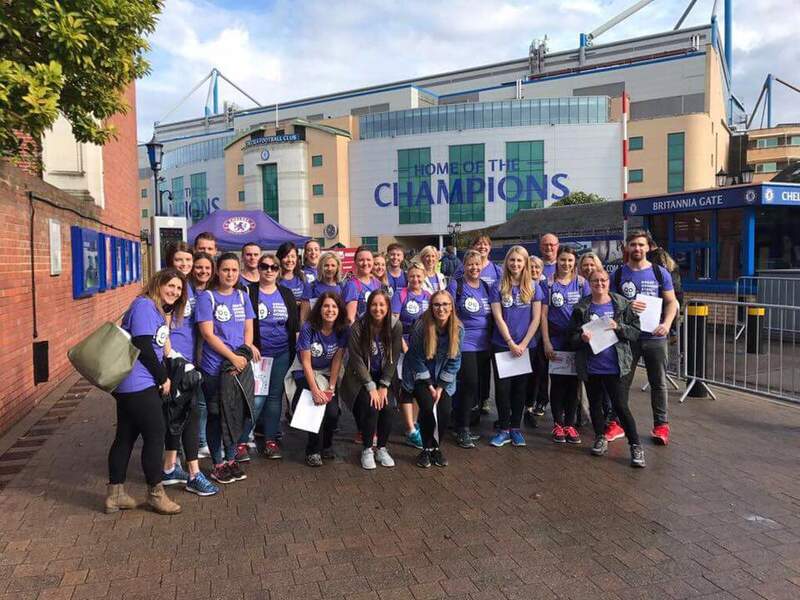 So, it was with this vital fundraising in mind that we met at a sunny Stamford Bridge, home of Chelsea FC, on a Friday morning at the end of September, resplendent in purple GOSH t-shirts and with route maps in hand. The first couple of miles were relatively quiet although we crossed our first two bridges: Battersea and Albert. 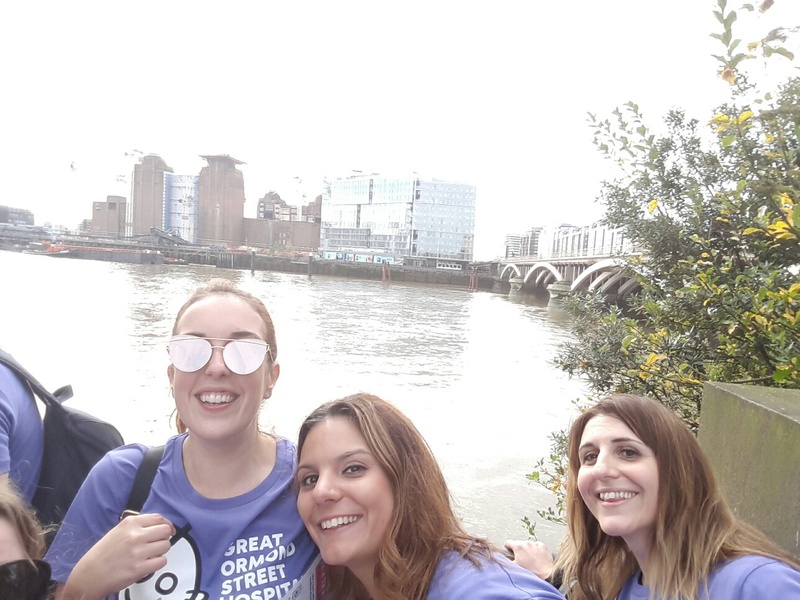 As we completed our third mile and crossed Chelsea Bridge, we got a great view of the first London landmark on our list: Battersea Power Station. Let the selfies begin! After that Vauxhall Bridge took us south of the river before we headed north across Lambeth Bridge, where we headed towards landmark two, the Houses of Parliament. 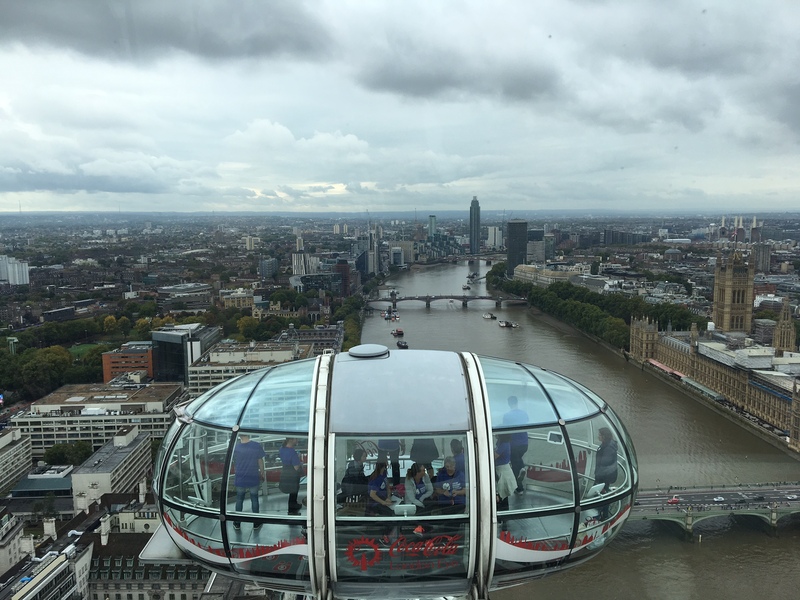 Westminster Bridge took us towards the London Eye, which was not only one of our landmarks but also the location for a breather as the entire team were treated to a ride on the iconic attraction. 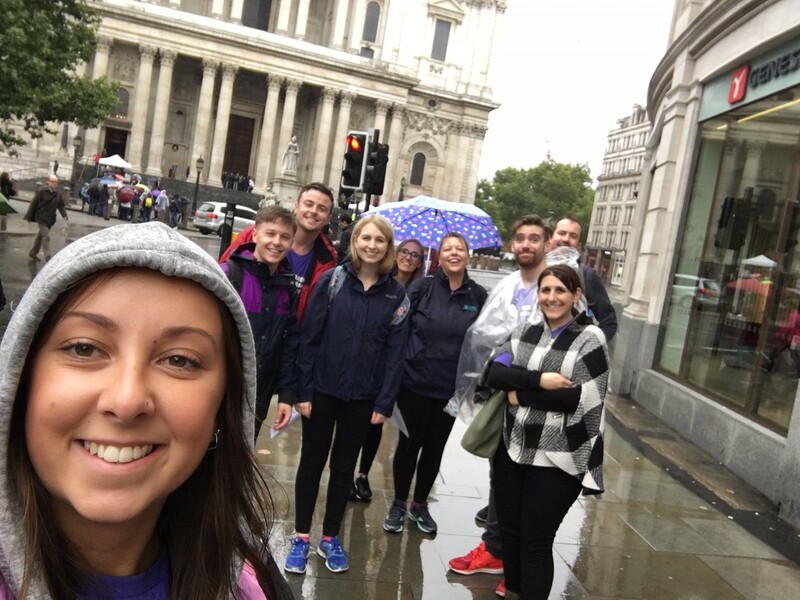 Although the weather had turned a bit grey by then we could see right out across the capital – our starting point was way across to the west and although our finishing point (Tower Bridge) looked quite close, we knew we still had more than six miles to go. Back across Westminster Bridge, past Downing Street and onto Trafalgar Square, where we all stopped for lunch – although nearly all of us stood to eat our sandwiches as we feared we might seize up if we sat down! By now, the weather was starting to turn against us and what we initially thought was spray from the Trafalgar Square fountains turned out to be drizzle. That soon became light rain, and before too long the heavens properly opened and the wind picked up, meaning the rain was hitting us almost horizontally! The ponchos and rain-macs out in full force! None the less we crossed and then re-crossed the Golden Jubilee Bridge, and as we headed south over Waterloo Bridge we had almost completed eight miles. As we continued to battle the weather and headed over Blackfriars Bridge, the landmarks started to come thick and fast: The Old Bailey, St Paul’s Cathedral and the Bank of England. South across Southwark Bridge and we took in Shakespeare’s Globe Theatre before heading north across London Bridge towards the Monument to the Great Fire of London. The rain had pretty much stopped now and we were inside the final mile. As we passed the Tower of London, our final landmark – and also our final bridge – came into view, Tower Bridge. Hooray! Some five hours after we had set off, the team crossed the finishing line having completed 12 bridges and 12 landmarks in 12 miles. Wet, tired, aching and with several blisters – but also with the knowledge that we had raised more than £5,500 for GOSH. 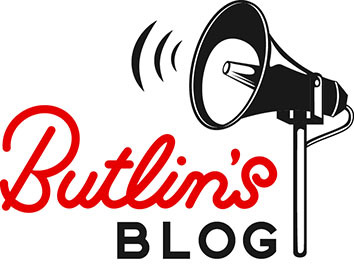 Our fundraising page is still open if you fancy donating (https://www.justgiving.com/fundraising/butlins12x12x12) and we know we have another fundraising challenge in April 2018. The details are a closely-guarded secret though!